Skin care is a vital part to beauty. If you have healthy and clear skin, layers of makeup are not necessary. Believe it or not, you may not have to look beyond your refrigerator for effective beauty masks that make your skin healthier. There are two particular face masks I use regularly that are tried and true. Sounds gross, but it is amazing. Take an egg and crack it placing the contents in a bowl. You may beat it and make it frothy, if you like. Spread it across your face and carefully avoid your eyes. The consistency will feel a little slimy at first, but it will dry. Once it dries your face will tighten significantly. Once it is completely dry, (I usually wait about 10-15 minutes), gently wash it off in a circular motion. Try to avoid your hairline, because that could become cumbersome. Voila! Nice fresh skin. Coffee is great as a scrub and milk contains lactic acid which is an active ingredient in spa grade skin peels. This mask is fantastic but it can be messy. Place four table spoons of coffee grounds in a bowl. Add milk slowly while stirring it until it makes a paste. Add more coffee if the consistency is too fluid. Add more milk if it is too hard and thick. Apply the paste onto your face. Make sure it is in the bathroom as it may drip a little. It will eventually harden once dry and you may experience a little tingly sensation from the lactic acid. Sitting with the mask on anywhere from 5 – 30 minutes is acceptable. When ready wash it off with warm water while gently massaging the coffee grounds into your skin. This mask is great for exfoliation and revitalization which makes up for the mess. Lemon Juice! Although it is not a face mask, if you can stand it, it can clear up trouble spots on your face. If your skin is misbehaving, lemon juice is a great astringent. Citric acid, which is also found in spa grade peels, are great for zits, wrinkles, and hyper pigmentation. Make sure your face is clean first. Take a cotton ball and soak it in lemon juice and apply it. It will almost immediately tingle. Try to withstand the tingling for at least one minute. I usually fan my face so that I may hold out a bit longer. Then wash your face with lukewarm water. Give these natural face masks a whirl. It just may be the beauty hack of all beauty hacks that have you looking nice and glowing for a mere fraction of the cost of beauty products. Witch Hazel has become one of the most important items in my medicine cabinet. It has multiple medical and aesthetic uses. Topically, it can be applied for minor skin rash, irritation, bug bites and sunburn. It can also clear up acne, blemishes, brighten skin, shrink pores and eye bags. I have used it for years now. 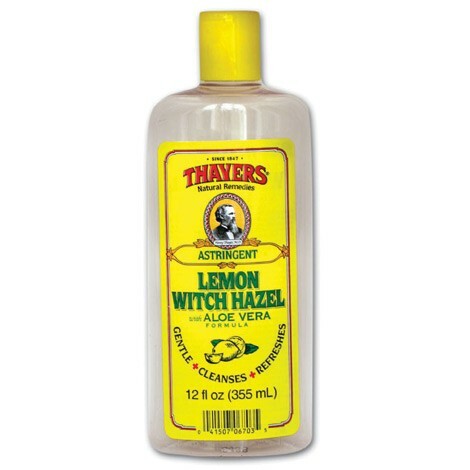 I cleanse my face and splash Thayer’s Witch Hazel with lemon on it and let it air dry before I apply makeup. I use nothing else. I have not had a break out since. It gives a natural dewy glow without over drying your skin or leaving it greasy. At night, I also put some on a cotton swab to remove eye make up and I dab a little extra under my eyes so that I do not wake up looking too tired or worn out. There are many other uses for Witch Hazel. Please check out some articles listed below for further uses.